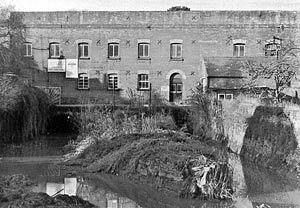 I wonder if anyone remembers when the old Mill Leat used to be cleaned out once a year, it was a time when the leat which powered both the Mill and the Laundry was cleared of any weeds and debris. This is unlike the flood relief channel which seems to constantly hold all sorts of rubbish. My father with the horse and cart from the farm would be joined with other hauliers to get the job done. I then lived at 18 St Andrew's Road and the leat ran past our back garden. There was an iron railing and a sort of slipway into the river from just by our front door which is where my father would set off for his part of the job. I believe the leat was dammed somewhere near Weircliff and the fast flowing water was stopped after being pushed into the Exe. This was the start of a mini adventure by quite a few of the village children, I cannot remember how many girls joined in but I was very much a tomboy and could not wait to start exploring the hidden nooks and crannies. I remember the sound of the rippling water and the cool quietness, we walked under parts of the small cottages which overhung the river and under the bridge that led to Buller Cottages and then to what was the most exciting bit for me. I was able to walk through the tunnel under the Laundry where there would normally be a swirling torrent of water. It was cool and dark and it had a wonderful echo. It was also a thrill to be able to stand by the water wheel that drove the laundry machinery. We played the usual children's games looking for fish or eels. I do not remember ever catching one although I was armed with the equipment to do so; usually a a piece of old bedstead known as a 'slasher'. I doubt if any children would be allowed to do these things now in the age of Health and Safety, but I remember it fondly as part of village life. Once the leat was clean, all would be back to normal with the Mill and the Laundry continuing their work and I, from the garden, could watch as the dam was removed and waited for the water to rush on its journey to the Exe and on to the sea. This memory first appered in the November 2010 issue of the St Andrew's Church Chronicle and is reproduced with permission. 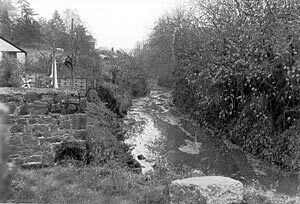 The leat behind 18 St Andrews Road. The laundry and 'tunnel' that Nell explored during the cleaning of the leat. Both photos by Alan H Mazonowicz.